I lost all form of self-restraint when I baked this ( not that I had much to start with). I was incapable of going into the kitchen without gobbling down a slice it was so incredibly moreish. 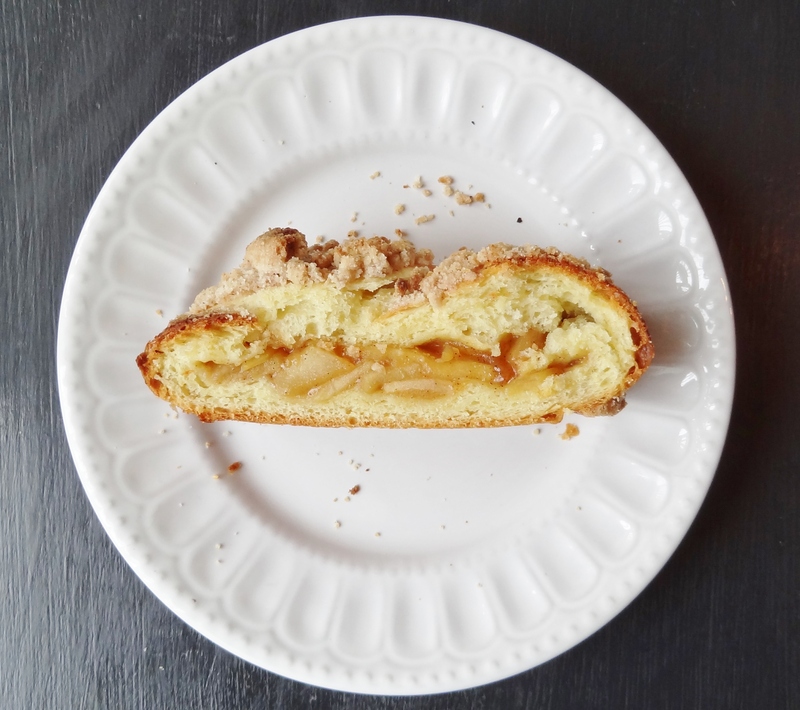 I got through nearly half of the loaf by myself in a day, and it is not a small loaf… I justified this gluttony by telling myself that the apples counteract the butter…right?! 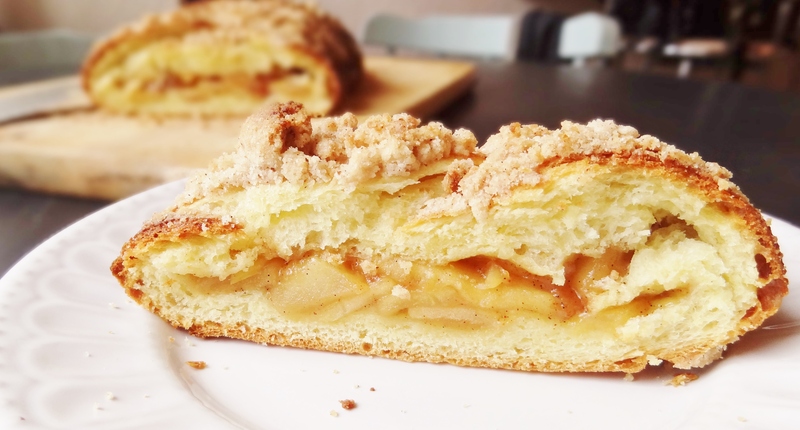 This is a sort of bread/pie hybrid made from soft, fluffy, butter-rich brioche dough wrapped around sweet, gently spiced apples. The kind of thing that would be perfect for a late Sunday morning breakfast, especially seeing as you start the dough the evening before and then assemble and bake it the following morning. Or, as I found out to the detriment of my waistline, it is delicious at any time of day, scarfed down with a cup of tea. I used plain flour for the dough rather than strong bread flour as it gives it a softer, more cake-like texture; for a chewier crumb and more bread-like texture use strong white bread flour instead. 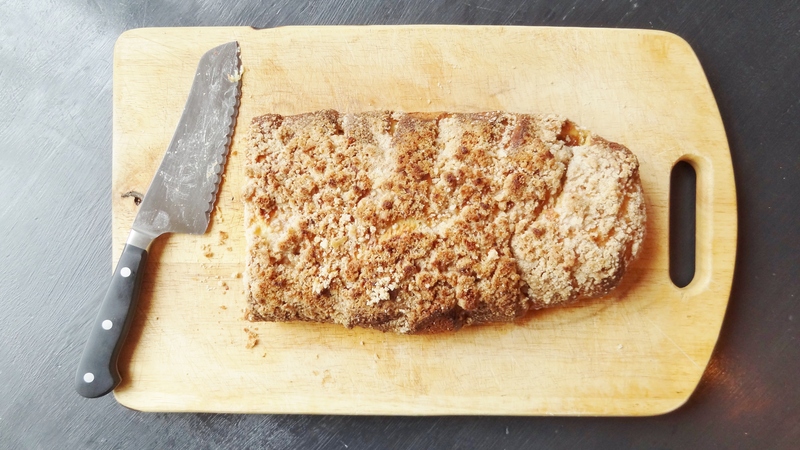 The brioche is topped with a crumbly streusel but I also think it would be nice simply egg-washed and sprinkled with demerara sugar. It’s also worth playing around with different fruits for the filling or even attempting a savoury one filled with cheese and roasted vegetables or ham. The brioche dough is most easily made using a stand mixer as it is incredibly soft and sticky but it can be done by hand – I don’t have a mixer, you just have to be prepared to really get stuck in there and get messy. Be careful with it when baking as brioche colours very quickly due to the butter and sugar – mine went a little dark before I got to it to cover it with some tin foil, so keep a close eye on it. To make the dough: place the flour, yeast, sugar, salt, eggs and milk in a large mixing bowl or a stand mixer, mix until it all comes together then knead for five minutes or so until smooth and slightly elastic. The dough is quite sticky so if you are kneading by hand be prepared to get messy! Add the butter in lumps and work it into the dough, again, this is more easily done with a stand mixer but is perfectly possible by hand; just get stuck in there and scrape, squeeze and knead the dough energetically until the butter is all evenly incorporated and the dough is smooth, soft and elastic (it will still be quite sticky though). Place the dough in a large bowl, cover, and refrigerate overnight (the dough will keep for a couple of days in the fridge). The following day start by making the filling. Peel, core and slice the apples and place in a bowl with the lemon juice, toss gently to combine. Melt the butter in a wide frying pan and add the apples, sugar, cinnamon, salt and vanilla extract. Stir to combine then sauté gently until the fruit has softened slightly and the juices have reduced to a thick syrup, set aside to cool. Once the apples have cooled, sprinkle over the tablespoon of flour and stir in gently. On a piece of lightly floured baking parchment, roll the brioche dough out into a roughly 10 x 15-inch rectangle, move the paper and dough onto a baking sheet. 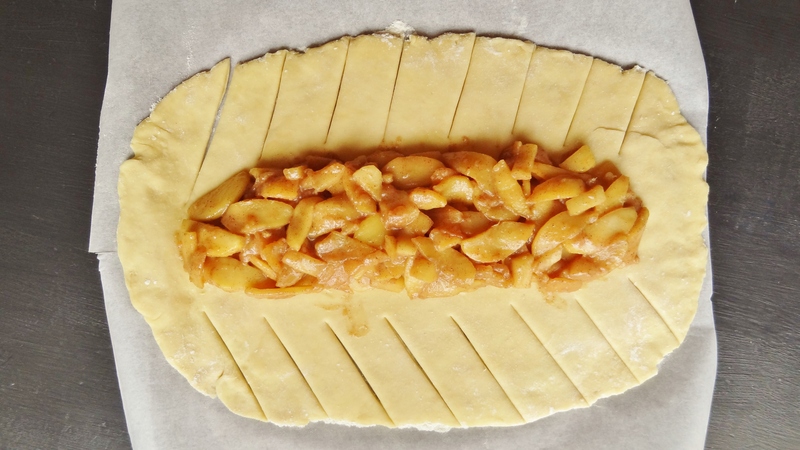 Spread the apple mixture down the centre of the dough, cut the dough surrounding the filling into diagonal strips about 1 1/2 inches wide making sure to leave a border of uncut dough around the filling. 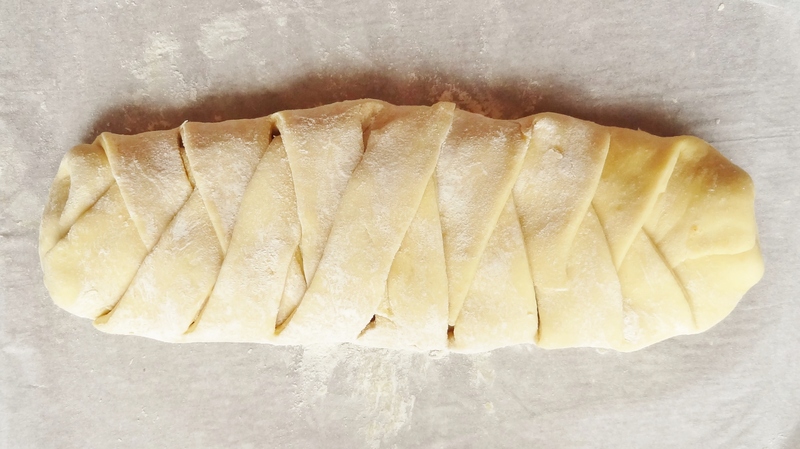 Fold the cut strips of dough over the filling, alternating sides so that it looks like its been braided. Loosely cover the dough with cling film and leave it to rise until it is puffy, almost doubled in size and springs back when you press it gently with a finger – about 1 – 1 1/2 hours. Meanwhile, make the streusel topping. In a small bowl stir the flour, sugar, cinnamon, and salt together. Add the butter in pieces and rub it in with your fingers until crumbs form. When the dough is ready to bake, preheat the oven to 180°C/350°F/gas mark 4. Beat the egg and gently brush it all over the dough with a pastry brush. Sprinkle over the streusel topping, place the baking sheet in the oven and bake for 30-40 minutes until golden and cooked through. Because of the large amounts of butter and sugar in the dough, brioche can colour very quickly on the outside before being cooked on the inside, so if it starts to darken too quickly, cover it with a piece of tin foil. Once baked, let the bread cool slightly before tucking in ( if, unlike me, you can restrain yourself). They are surprisingly simple to make, and so satisfying! This looks delicious! Thanks for sharing at the fiesta! Thank you so much for bringing this to Fiesta Friday! I love how you stuff the brioche with apples. It looks amazing! It tastes pretty amazing too! 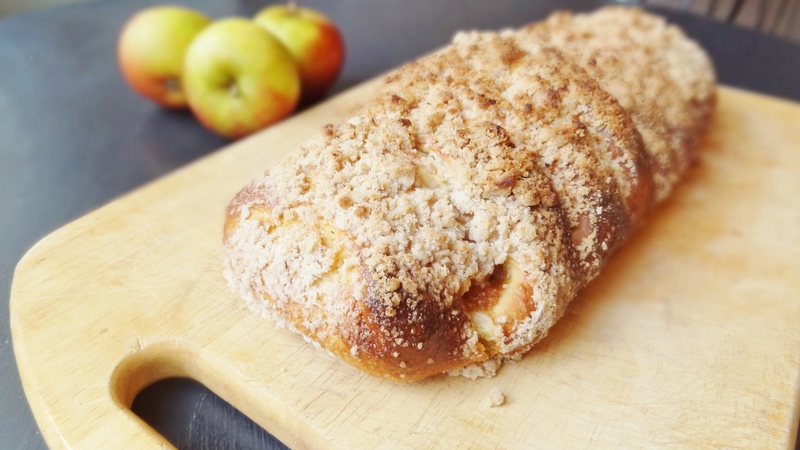 streusel, apples, brioche!?! you’re killing me! Pretty too! looks AMAZING! can’t wait to dive into it this Fiesta Friday! Oh My! I love everything about that recipe. It is gorgeous and your instructions make it seem less complicated. Thankyou! 🙂 It is actually surprisingly simple! What a amazing bake! Absolutely gorgeous! oh my this is gorgeous, I could definitely eat the whole loaf myself given the chance! I almost did…my fiance had one slice…i ate the rest! The way it should be haha! Hi Natalie, I think that should be fine but you may want to re-warm it in the oven once it defrosts.